ANDY BAUMGARTNER/Staff photo. 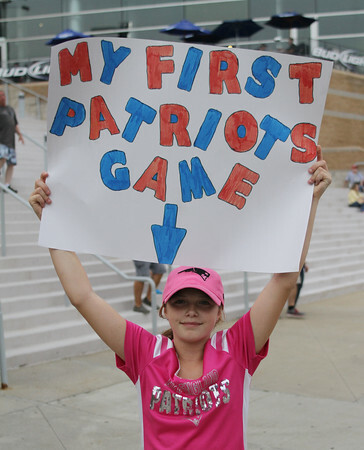 A Patriots fan Kayla, from Jeffrey, NH, holds up a sign "My First Patriots Game" prior to the start of the Patriots last preseason game against the Giants on Thursday evening. Earlier on Thursday quarterback Tom Brady's 4-game suspension was overturned by Judge Richard Berman. 9/3/15.